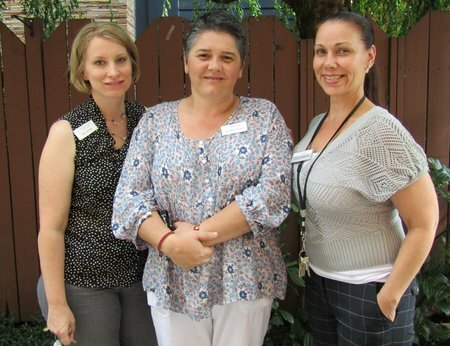 Members of the Emerson House leadership team: (l) Executive Director Erin Jones, Residential Care Coordinator Gordana Hrvic and Director of Wellness Julia Schon, MSN, RN. For over a decade, Housecall Providers has been offering the residents of Emerson House home-based primary care and hospice services. Memory care communities, like Emerson House in SE Portland, were created solely to serve the needs of people with Alzheimer’s disease and other medical dementias. In addition to those diagnoses, many of their residents suffer from other medical conditions that can further impact a resident’s quality of life. Enter Housecall Providers. Jones knows the value of providing in-home medical care to people with dementia. She says that residents behave differently when they are transported from their familiar space, and sometimes after a trip out it may take days to get them back into their normal routines. Currently, Housecall Providers has 16 patients living at Emerson House and all are seen by nurse practitioner Aurora Curelaru, FNP. “Aurora can make what I believe to be better medical decisions for our residents because she sees them in their environment. Frankly, on occasion she can see something environmentally that we do not see because we are here every day,” says Jones. The staff and administration at Emerson House really appreciate the professionalism and efficiency that each Housecall Providers clinician demonstrates when they visit the facility. Because of Housecall Providers’ continuum of care, Jones says that the transition for residents from primary care to hospice is a smooth one. One of the reasons is Hospice Social Worker Youske Eto, LCSW, who is a favorite of staff because of the gentle but firm touch he has with patients’ family members.